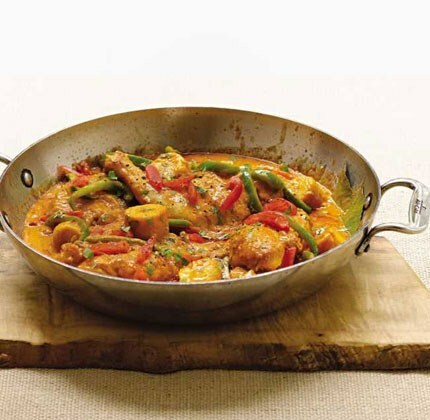 This is a version of the traditional seafood moqueca. The plantain, which Brazilians prefer ripe or semi-ripe, brings a soft sweetness and plenty of starch to the stew. Place the chicken pieces in a medium bowl. Season with salt, pepper, and 2 tablespoons of the dende oil. Rub the chicken all over with the oil. Cover the bowl with cling-film and marinate at room temperature for 15 to 30 minutes. Pour the remaining dende oil into a large flameproof casserole and swirl around so the entire base is covered. Add the chicken pieces, skin side down, and brown them lightly over a medium heat, for 3 minutes per side. Transfer them to a bowl and cover with foil, making sure no steam can escape. Add the onion, spring onions, and pepper to the pan and cook them in the left-over dende oil, stirring often, until they become soft, about 4 minutes. Add the white wine and reduce by half, while using a wooden spoon to scrape the brown bits that remain in the pan. Add the garlic and ginger and cook, stirring, for another minute. Add the chicken stock, coconut milk, tomato puree, and bay leaves and bring to a boil. Reduce the heat to the lowest setting. Add the chicken and any remaining juices that accumulated in the bowl. Season lightly with salt and pepper. Simmer, covered, until the chicken starts to get tender, about 1 hour. Meanwhile, trim the ends off the plantains and cut 3-4 vertical slits in the skin, making sure not to cut deep into the fruit. Peel and cut the plantains into 2.5cm chunks. Add the plantains to the moqueca after it has been simmering for an hour. Cover and continue to simmer until the plantains become soft but not mushy, about 10 to 15 minutes. If the liquid seems too runny, uncover the pan and continue to simmer, allowing the steam to evaporate and thicken the stew. Season with salt and pepper. Just a few minutes before serving, add the tomatoes. Garnish with the fresh coriander and serve over white rice or farofa. This entry was posted on January 29, 2011 at 10:15 am and is filed under Food with tags bay leaves, brazilian, chicken, chicken stock, coconut milk, coriander, dende, freshly ground black pepper, garlic, green pepper, onion, palm oil, plantains, plum tomatoes, recipe, root ginger, sea salt, spring onions, tomato purée, white wine. You can follow any responses to this entry through the RSS 2.0 feed. You can leave a response, or trackback from your own site.